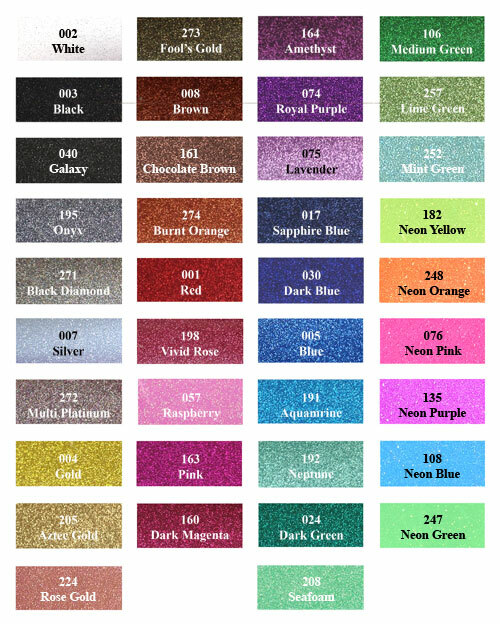 Heat Transfer Vinyl Glitter - for making custom fashion t-shirts, etc. 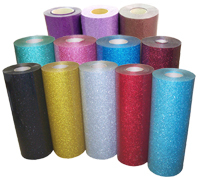 Heat transfer glitter film is ideal for making fashion custom T-shirts, team wears, etc. Just click the category link below to see product specifications and price list. FDC Lumina 9105 Series glitter heat transfer film is designed for application to textiles, with an attention grabbing glitter look that adds sparkle to your graphic. For use on 100% cotton, 100% polyester and poly/cotton blends. New colors: Galaxy (040), Chocolate Brown (161), Seafoam (208), Neon Pink (076), Neon Blue (108), Neon Purple (135), Neon Yellow (182), Neon Green (247) and Neon Orange (248). These 8 new colors have recently been added to this 9105 series. This series of glitter heat transfer vinyl looks fabulous and they can be used for any type of garments for fashion or simply just for glamour. Application: for fashion clothing, etc.